An easy purchase for anyone who likes the electric blues. With seven albums behind him, this live album in front of 500 people in Rosmalen, Holland is an authentic and accurate reflection of Danny Bryant’s talent. He squeezes a lovely tone out of his Fret-King electric. Bluesmen study their lineage, mastering the licks and songs of the bluesmen that have gone before and Bryant is no exception. This release: available as both a DVD and a CD, is as an authentic experience of the man’s talent as is possible without actually seeing him in person. If you stand in the middle of your living room, invite a few friends round to jostle you occasionally, and drink a few watered down beers out of a plastic glass as you watch the DVD you could easily fool yourself into thinking you were there. It’s well shot, with some terrific close ups of Bryant’s fretboard so that you can marvel at his technique. It’s inspiring for any budding guitarist or indeed any guitarist who wants to know how to combine feel and technique. Apart from his busy fingers, and sweat on his brow there’s not a lot of other visual action here. The rhythm section backs him sensitively and unobtrusively. Drummer Trevor Barr is content to concentrate, while chewing gum, on keeping the rhythm in the pocket and the bass player Ken Bryant (Danny’s father) locks into the beat tightly with Barr, barely moving from the spot, happy to let his son hog the limelight. There are elements of Clapton, Gallagher, Guy and most obviously of all Walter Trout in Bryant’s playing. The Trout connection doesn’t stop at the guitar, vocally he sounds very similar to the American too. 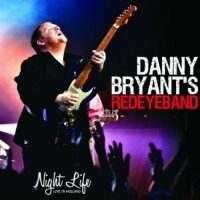 Freed from the constraints of the studio suits Bryant as live his solos have a chance to really stretch out. Although he can play wild flurries, he never lets the music stray too far, bringing the solos back to the songs’ melodies. His self penned material like ‘Tell Me’, the searing ‘Heartbreaker’ and band favourite ‘Always With Me’ sit well amongst the covers of Dylan’s overplayed ‘Knocking On Heaven’s Door’ and more interestingly John Hiatt’s ‘Master Of Disaster’ and Buddy Guy’s ‘My Baby’s A Superstar’ which gets a welcome airing and Bryant captures the light and shade Guy is capable of. Sensitively backed by his father Ken and Trevor Barr and with excellent liner notes by Classic Rock’s knowledgeable Henry Yates, this CD and/or DVD is an easy purchase for anyone who likes the (in all senses of the word) electric blues.